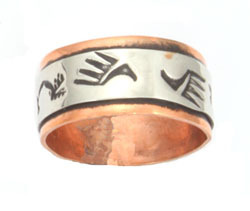 This band is made with copper and has a strip of nickel with stamping. It measures approximately 3/8" in width. The silver strip in the center measures approximately 1/4" in width. Made by Navajo artisan Thomas A. Begay. Stamping will vary. ***Now available in size 6,9,10,11 or 12. *** Choose when ordering.